This quintessential country-garden Marquee Wedding encompasses everything we love, barmy summer days, colourful flowers, and bringing together friends and family to celebrate. 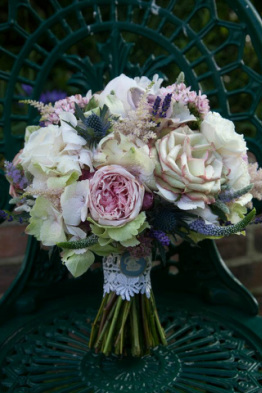 The venue Brewerstreet Farmhouse was a perfect fit for the theme, a Tudor mansion set in beautiful gardens on the outskirts of the lovely village of Bletchingley in Surrey. The Bride and Groom wanted to keep details natural, although a lot of effort went into the preparation it was important to the couple that nothing should look forced or over-done. Floral arrangements by the very talented Amanda from Distinctly Floral. A Nerissa Eve recommendation! Classic cut glass drinks dispenser filled with Pimms. These are available to hire and can be personalised with your names and date of wedding. Lovely touches like the cameo on the Bridal bouquet, the classic cut glass drinks dispenser for the cocktail hour and the beautiful personalised 'Mr & Mrs' flower boxes helped to make this day unique. Monogrammed straws with the date of the wedding on the reverse. The table centerpieces were stunning, the height of the candelabras mixed with tables decorated, birdcages all arranged with beautiful roses, ... & thistle worked really well. Mixing the centerpiece decoration is a simple way to add drama without over working the look. The tall ivory candelabras are especially effective at allowing uninterrupted conversation for your guests. Little jars were interspersed filled with the same pretty flowers and the tables were scattered with tiny rosebuds. The Bride and Groom had recently spent a year travelling around the world so they wanted to incorporate this into the day. We used map hearts and the vintage suitcases as a suggestion of travel. 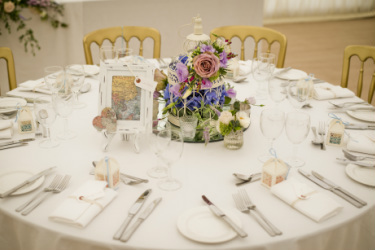 The Vintage suitcases work really well filled with a floral arrangement but can also be used to collect your wedding cards or for an alternative table-plan idea (have a look at the inspiring ideas page). 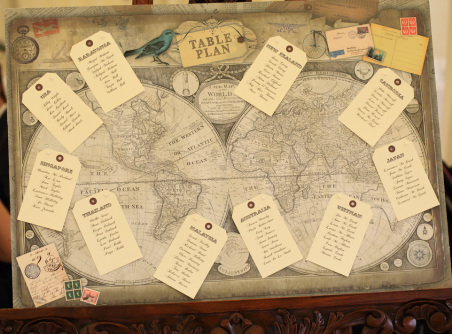 Inspired by the Bride and Grooms travels, we created a table plan using an antique map and luggage labels for the guests names. Each table was named after a country they had visited and loved. Bringing in personal touches where ever possible is the key to your perfect day. The table plan and luggage labels are available to buy. Beautiful silk vietnamese lanterns available for hire. Music by Classycool String quartet, Covent Garden. 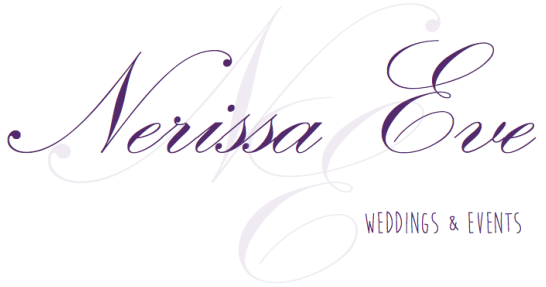 A Nerissa Eve recommendation!